Narrative: Crews extinguished a dumpster fire. Narrative: Crews extinguished a fire that started in the engine compartment of a motor vehicle (car). 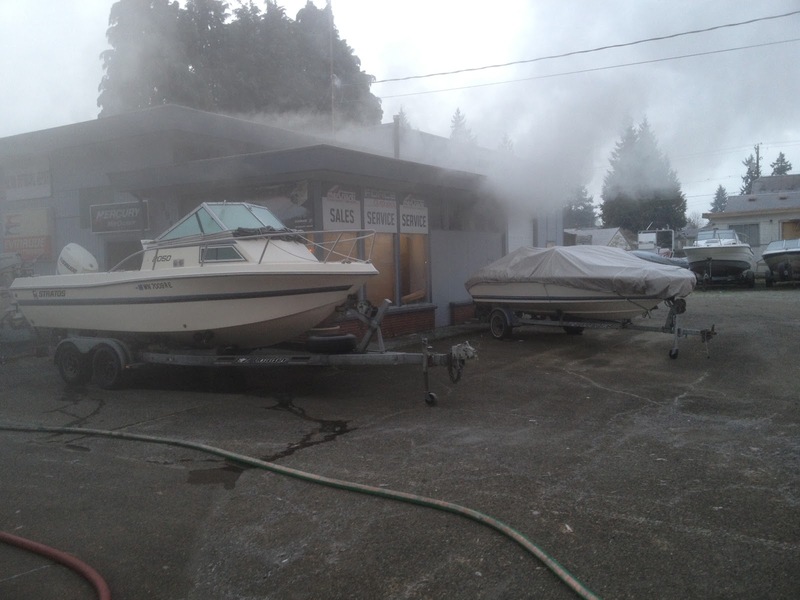 Narrative: Overloaded extension cord and electrical outlet sparked fire in boat motor repair business. See original post here. Narrative: Fire in the engine compartment of a motor vehicle (car). Narrative: Fire in the engine compartment of motor vehicle (car). Incident Location: 909 Earnest S. Brazill St. Narrative: At 6:47 p.m. Tacoma Firefighters responded to a reported house fire. The first arriving company found flames and smoke showing from the 1 story with a basement residence. Since initial reports were that one occupant was trapped in the building, the crew initiated "rescue mode" (searching the building before other units arrived). However, the search revealed no entrapment. The cause of the fire is undetermined, resulting in an estimated $15,000 damage to the building and its contents. Narrative: At 7:44 a.m. Tacoma Firefighters responded to report of smoke showing from a boat motor repair business. Crews forced entry into the building, and worked quickly to knock down a smoldering contents fire in the workshop area of the business. UPDATE: Investigators believe an overloaded extension cord sparked the fire that resulted in an estimated $15,000 damage to the building and its contents. Narrative: Open flame heating device ignited combustibles. Occupant threw flaming material outside, catching the soffit and wood above the window on fire in the process. Narrative: Prohibited burn - firewood and trash. Narrative: Illegal burn of an old tire for warming at a homeless camp. Narrative: High speed fatality collision. Single occupied vehicle crashed into two parked vehicles. The impact resulted in a fire that damaged three vehicles, a power pole, a planter and bench. Narrative: It is likely that a warming or cooking fire started by transients ignited the vacant and abandoned home. No suspects. Narrative: Improperly discarded cigarette ignited mulch in planter box.